There’s nothing quite like the feeling of buying lights and seeds and walking out of the store into a below zero wind chill. Mixed feelings – but most of all, hope. 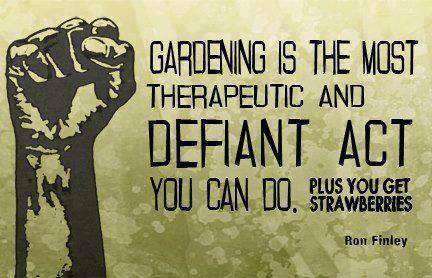 Defiant? Maybe. I get more tomatoes than strawberries. There’s snow outside, but I know it will melt. Give it a few months. 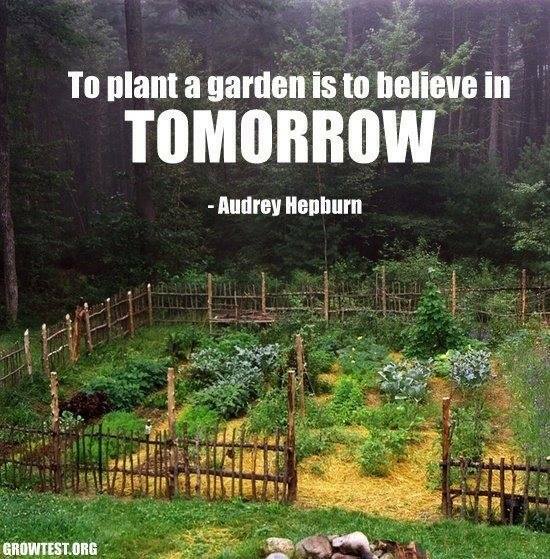 I’ve also heard that to start planting in winter shows faith that spring will come. What does it mean if we bought grow lights, seeds, and a snow shovel from Home Depot today? Deal? Read the Tags. All the tags. I’ve been considering putting a few lights in the backyard. I’m not talking about extending power to the garden patch, but just a few stakes with solar-powered lights in them. I would then be able to take out compost after dark without tripping. I bought an inexpensive wind chime that had such a light in it, and the darn thing never worked. I guess I got what I paid for in that case. 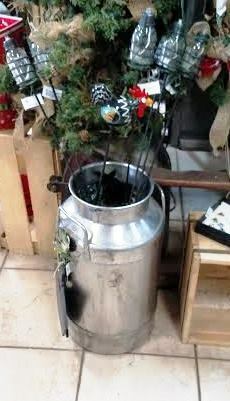 When I saw the tiny (about 6 inches tall) canning jar facsimiles in a specialty store, I thought about getting a few. I looked more closely. 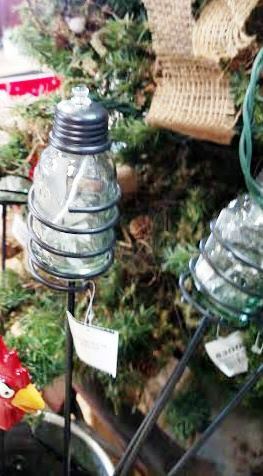 The adorable little mason jars with solar-powered lights inside were available at a cost of $8 each. Oh, my. That’s a little steep, considering I want several. Also prominently stamped on the tag: Made in China. No, thanks. 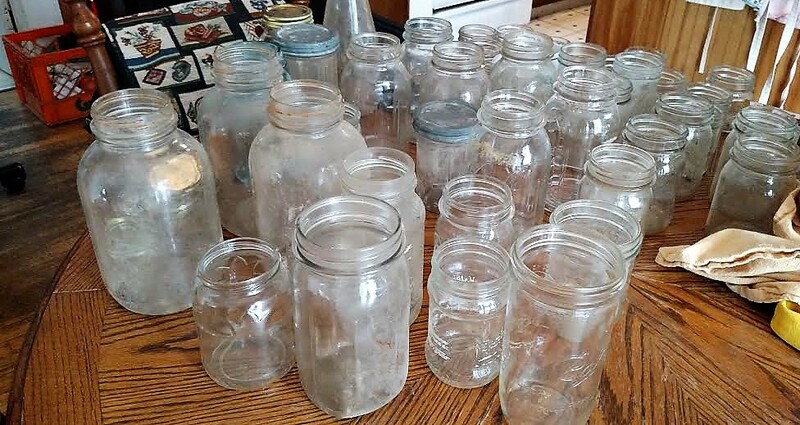 Maybe I can convince my engineer husband to rig something up using mason jars I already own. Chuck, what do you think? I haven’t posted lately because we’ve been – yep, you guessed it – very busy. Let’s skim the high points. Chuck has a new job! He’s no longer making sure the news gets on the air. He is no longer driving and running and repairing live trucks and satellite trucks. He is now installing electrical components in brand new fire trucks. He’s been training for a week now, and it looks like this job is a fabulous fit for him. His official title is Electrician, Fire Truck Division. In other news, it’s Christmas concert season for Amigo and the barbershop chorus! He’s already sung in two shows in two weeks, and the third comes up in a few days. He looks very festive in his elf costume, and his sense of humor keeps rehearsals light. For example, consider the following. Dress rehearsal at the restaurant that will host the Barbershop Bistro. Risers are set up, guys are in place, lights are adjusted. Director scans the chorus and asks, “Is there anyone who can’t see me?” Think on this for a minute. Amigo, he of the white cane club, gleefully raised his hand. The chorus members were beside themselves with laughter. When I picked him up two hours later, the guys were still chuckling. He livens up a party, all right, my Amigo. My holiday shopping spreadsheet is in place, and I’m filling in the blanks. 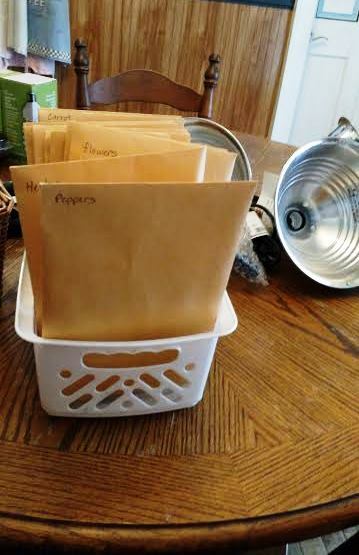 Wrappings and trimmings and trappings are organized and ready for use. The Christmas music CD collection is accessible – those albums not on my desk at work, that is. The O.K. Chorale is settled in for the remainder of December. The blog might even reflect that – when I have time. 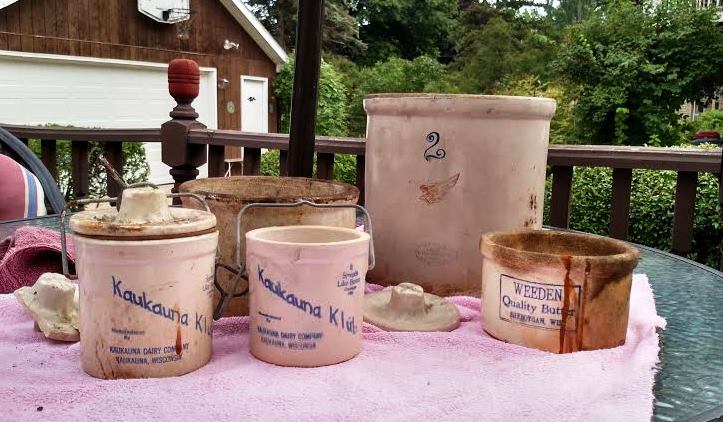 The batch of jars from a recent estate auction contained some interesting variations in size and shape. 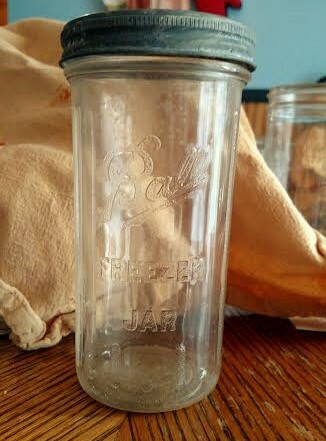 Several were the basic half-pint jelly jar size and design. Some were different. Some had the word “freezer” embossed on them. Most were Ball; a few said Kerr. Two or three lids, the solid gray lids – does anyone know what they’re made of? 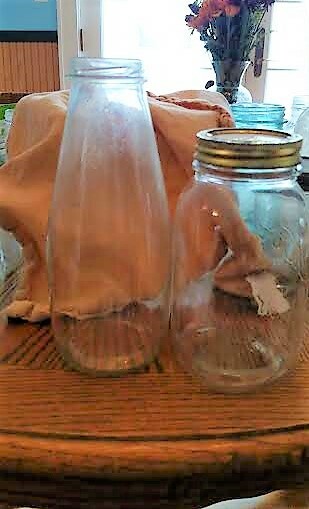 I’ve seen lamps and hanging lights made from jars with this type of lid, so I’m not quite ready to throw them away. For now, I’m sorting and storing those that are clean and suitable for food storage. The others might become…well, who knows? 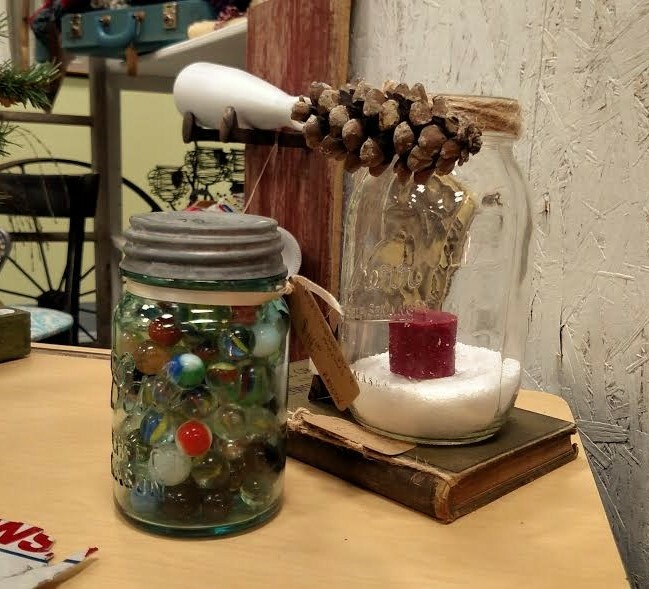 It’s all part of the fun of finding and procuring and using old jars. The project started like this. Then we gave the dishwasher a try. Almost all came out clean. Those that didn’t, well, I might scrub or soak them, or I might just use them for something other than food preservation. Then we visited one of my favorite vintage and antique stores. I saw all kinds of ways to use canning jars – other than canning. What is the candle sitting in? More wax? I have marbles. I could do the one on the left. Simple. Clean them up, surround them with greenery. And people are charging amazing amounts of money for these. 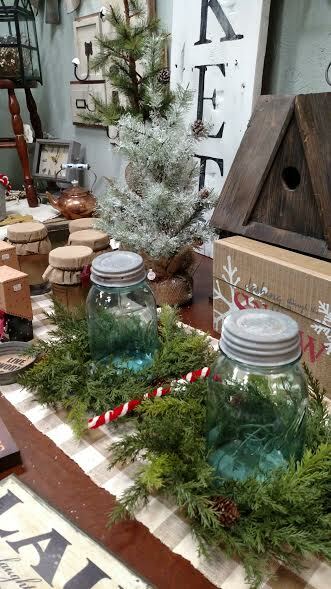 To give you an idea, the two blue jars surrounded by pretty green decorative wreaths were priced at about the same amount of money that I paid for the entire table full (see top of post). I can do this. The only question is – will I do it? Will I make the time to do it? Stay tuned, readers. Daisy has a project in mind. Yet another cabinet member has been announced to a fanfare of “Oh, no!” Amigo didn’t remember the name, but he remembered enough to inform me that the new Secretary of Education will be a “billionaire school choice advocate.” I can only take so many of these announcements. They’re bad for my blood pressure. In the interest of my own health, let’s look for some silver linings. The next time a woman runs for president, she will not have to jump the same hoops that Hillary did. Trailblazers, Geraldine Ferraro and Hillary Clinton included, blazed a trail so that others can follow. Tomorrow is Thanksgiving. We’re bringing mashed potatoes, butternut squash, Packer veggies (peas and corn), and cranberry sauce. Have I forgotten anything? La Petite will bring the wine. The potatoes are in the crock pot as I type. Oh, pies! I bought pies from a local bakery this morning. The nearby meat market (I love that place) was hopping. In fact, I changed my route to avoid the traffic on their corner as I was on the way to the bakery, another small business I love. I walked in, paused to inhale, and then picked up a box of cookies while I waited for my turn. The problem with shopping at a local bakery is simple; I always come out with more than I planned to buy. Problem? Maybe that’s not a problem. Small Business Saturday is coming up, and I saw two small businesses that were doing well already today. I predict January will bring another down period. This inauguration will be hard to take. But for now, let’s look at positives. For those who celebrate, enjoy your Thanksgiving. 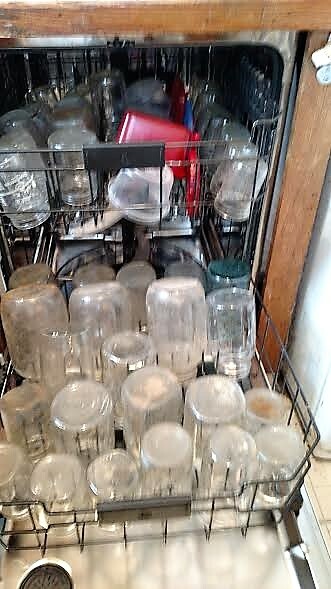 Buying a Dishwasher – fun? We did the research online before heading to the Big Box store. On the short drive there, I tapped into as many Pokemon Stops as I could (to fill my bag with balls, etc. ), and Chuck told me all about the features we could get. Sales Dude in Blue approached, and we welcomed him. He knew what he needed to know, so we asked our questions, got answers, made our decision, and ordered a dishwasher to be delivered and installed in a few weeks. Somehow, within this entire shopping journey, we discovered that we have a great deal in common with Sales Dude in Blue. Gardening, canning, foraging. Foraging! 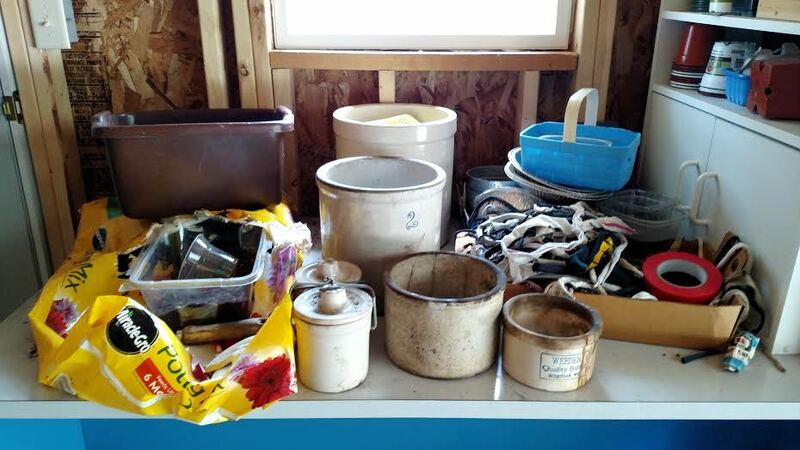 Water conservation, rain barrels, desire to see more cities rewarding those who conserve. Cataract surgery. Cataract surgery? Yes, indeed, Sales Dude in Blue recognized a particular glint that indicates eye surgery, and asked if I was satisfied with my results. For the most part, yes, I answered. If the left retina had stayed attached, I’d be more content. But anyway, we’re replacing our aging dishwasher in a few weeks. Days, in fact, before Election Day. Oh, my, even the behavior of a major appliance can make me think of November 8th. I sense a theme here. We didn’t talk politics with Sales Dude in Blue. We didn’t need to. And when we’ve had the dishwasher for a few days and Election Day is done, I’ll have more reasons to sigh with relief. 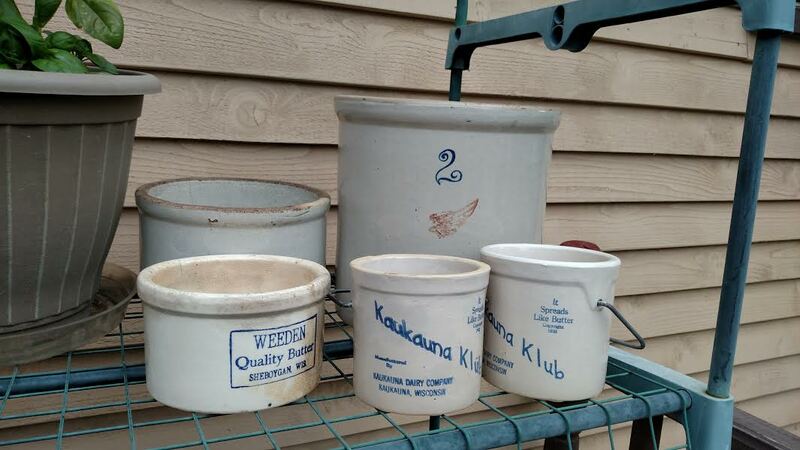 I have a 3 gallon Redwing stoneware crock that I bought at an antique mall. I also found a very large (6 gallon, I estimate) that had a huge crack in it. I caulked the crack in the crock, and then set it aside. I plan to plant in both crocks. You can see the #3 at the back of the table. Here’s the “before” picture outside on the deck in better light. Here they are in the sunshine. Some are in better shape than others. And now, the “After” picture. I was pleasantly surprised with the condition after cleaning. Most were just dirty, not damaged. Readers, I’m thinking of planting chives in the #2, and maybe succulents in the cheese and butter crocks. What do you think? 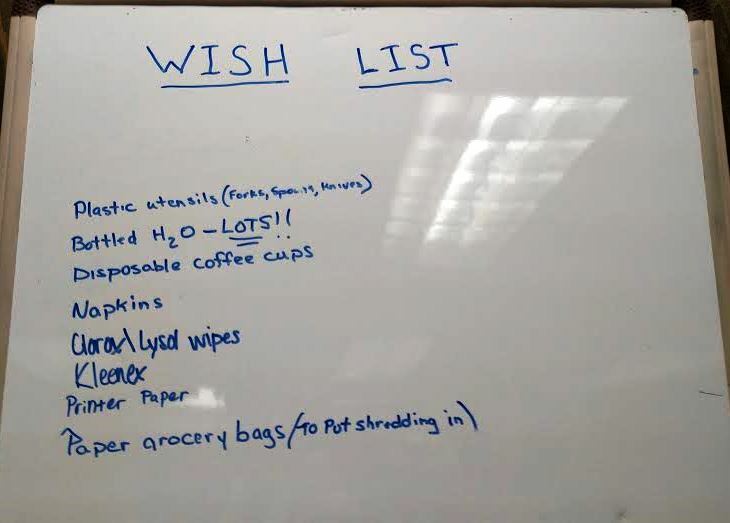 I posted this Wish List recently with a comment that many items on the list aren’t eco-friendly. I gave in and bought several items to keep the volunteers hydrated and happy. I gave in and bought plastic utensils, paper napkins, tissues, and cleaning wipes. I didn’t go for brand name products unless there was a clear difference in price and/or quality. The coffee cups I found were biodegradable, not the icky foam alternative. I stared at the paper napkins for a while; I haven’t bought paper napkins in years, so I had no idea what kind of prices to expect. We (La Petite and I) dropped off the goodies at the Democrats’ office. The volunteers were very grateful, especially for the bottled water. The weather was hot, the air conditioner was unreliable, and they’d run out of water a few days earlier. In exchange for the donations, I asked only for two signs. I’m the first on our block to show tangible evidence of voting preferences.